I'm back with a new cosplay project to share with you. First, I'll start off by apologizing for the halting of the Wired Marionette project. Almost all the metal parts have to be redone now after running out of fabric. (And now as a result some parts don't match color). However, I still wanted to get an iDOLM@STER cosplay out before Phoenix Comicon so I turned to one of my favorites, Street Hopper! Street Hopper has been one of my favorite costumes ever since the DLC hit the Xbox 360 version, and when it was available free in Ps3 I was so happy to get it unlocked! As of today, it is completely finished so let me quickly review some of my construction notes. I bought these shorts at Goodwill, however they were white...very white when I bought them. 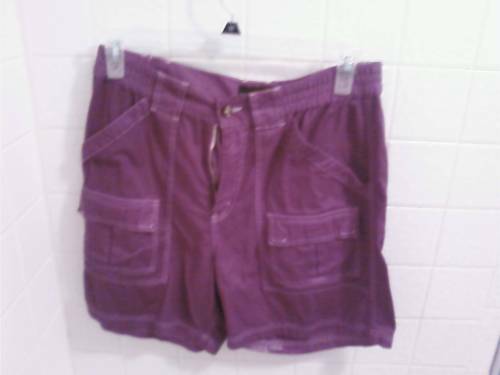 After completely washing and drying the pants turned out PINK. 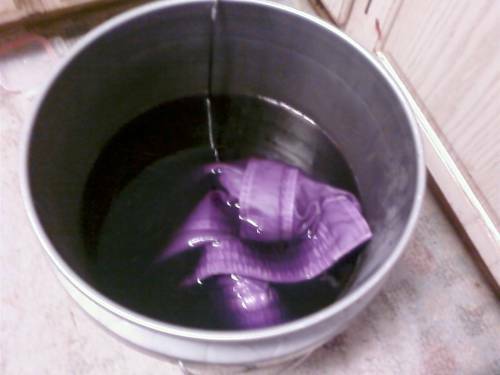 After several minutes of "Doushiyou kana"-ing, I decided to try and re-dye the pants, this time with Scarlet. After a 3 hour soak, they turned out as they are now! Really fantastic! Bought a little boy's tshirt from Goodwill and a black sports bra from Walmart. However, I have bad experiences using iron on transfers. But! There is another method if you're like me and don't mind doing it. I bought these colored bandanas at the crafts store and a package of Wonder Under interfacing. Then I created these appliques using the bandanas and the interfacing and used the tutorial as a guide. I created my own bias tape out of some red fabric to attach to the sleeves and the top of the blouse. (If you attempt this be VERY careful you test fit after sewing loosely. Attaching a non-knit to a knit can cause it to become unable to stretch). This method is long, but with patience you'll have a professional looking shirt. Did not aim for perfection here. Unlike Scarlet Sprite and Wired Marionette, the shoes are not one of the main foci of the costume. So I got some white shoes from Walmart ($6) and colored them with fabric markers and sharpies. The main point is that they look fun and colorful! Yellow chain was some kind of thing of a baby thing....colored it with neon fabric marker. 765 Heart logo and Star was made with metallic and gold fabric and interfacing. Gloves were made from an old sweater and another old mitten I had to make the pattern from. Ribbons were made from some red fabric I had left from the self made bias tape. Phoenix Comicon here I come!! Please try out this costume for yourself if you can! It is a lot of fun. Feel free to drop me any questions. Re: Amami Haruka- Street Hopper! Thanks!! <3 You have good taste then. One of my favorite costumes as well, looks like it came out well! ^_^ b Thanks!! Of course the HarukaP love this costume! It looks so great on her. Can't wait to see you in costume! A little preview. It's too dark today. Either the idols' proportions are more exaggerated than I thought, or the long shorts are covering up the difference. I went based off of an anime illustration where they were depicted a bit shorter. I saw on her Tumblr that she finished her pants!! I wish her luck! If you both were going to A-kon i'd tell you guys to meet up.